Credit card debt has a sneaky way of building up quietly until you can't see over the pile. If you're struggling to make payments, it's time to regroup and set a new direction. The first step to reducing your debt is to stop adding to it. Put your credit cards away and use cash instead. Call your credit card companies and try to negotiate a lower interest rate, which will lower the minimum payment each month and cut down on finance charges as you go forward. Your company may not budge, but you never know until you try. Find out how much interest you're paying on each credit card and choose the card with the highest rate to focus on first. Keep up with the minimum payments on the other cards and pour as much money as you can into paying off the high interest credit card. After you've paid off that card, choose the card with the next highest interest rate, and pay that one down. Continue in the same manner through your stack of cards until you're finished paying them off. The good credit card news: Once you get a card paid off, you lose one minimum monthly payment and have more money to put toward paying off other cards. These companies charge big fees, tell you to stop paying your credit card bills, and promise to settle your debt with credit card companies for less than you owe. Many of the outfits have come under fire for taking advantage of consumers. 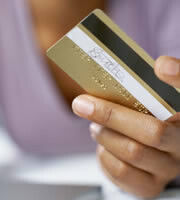 You can settle credit card debt on your own by negotiating directly with credit card companies. Beware, however, that if you settle the debt for less than you owe, the settlement does appear on your credit report and hurt your credit score. Consult with a credit counseling service recommended by the National Foundation for Credit Counseling to help you address the problems that led to your overwhelming credit card debt. Credit counselors can help you sort through your finances, set a realistic budget, and get you back on track. 0 Responses to "Credit Card Debt: What to Do If You're In Over Your Head"